KWD 28.92 including 11.58 KWD shipping. 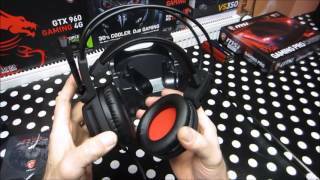 The gaming headset with microphone, enhanced virtual 7.1 surround sound, intelligent vibration system (ds 502) Speakers & Headset is manufactured by MSI and was added around June 2018. Price has increased 6% from KWD 16 on 2018-06-13 to KWD 17 today.